If you are considering adopting an essential oil lifestyle, Kudos! These oils have been around for centuries and are used in various cultures throughout the world to support health and wellness; I have no doubt you’ll learn to embrace the many benefits of using essential oils. There is a lot of information out there, and it all can be slightly overwhelming at first. Learning about the properties of the oils, deciding what you need to have on hand, and what to buy. Trial and error can get expensive. Take heart! It is not necessary to buy a lot of products and essential oils right away. It IS important to give yourself the time to see how you respond to the oil, and to learn about all each oil has to offer. Each one has different properties to familiarize yourself with. Many can be substituted for a different oil that has the same properties. 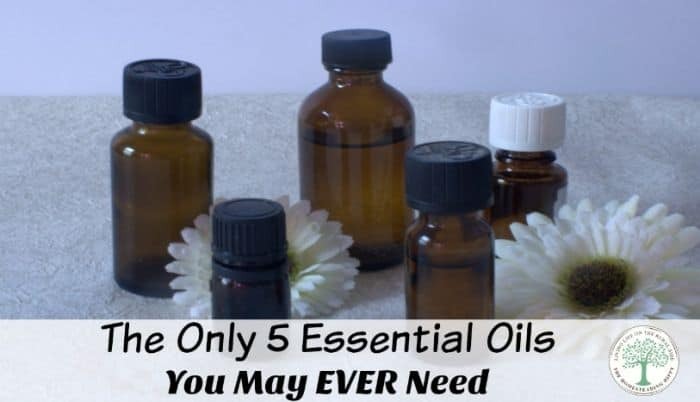 You can get started with 5 basic essential oils, and honestly, these 5 oils are the only ones you may truly ever need. Lemon essential oil is probably my favorite for the home. It can be used in more ways than any other oil. When you need a DIY household cleaner, laundry booster, or spray; lemon essential oil acts as a powerful anti-microbial. It is often used in cosmetics and for skin care due to its rejuvenating and detoxifying properties. Therapeutically, lemon essential oil may help improve concentration and mental clarity by fighting mental fatigue and anxiety. Also known as Melaleuca oil, Tea tree essential oil is widely used to treat a variety of skin irritations. Tea tree is the best choice for purifying the air in your home. It is strong, yet soothing and is often used in household and skin care products due to it’s antibacterial properties. Some refer to Tea tree oil as their all-in-one medicine cabinet. The most versatile of all the oils, Lavender essential oil is an indispensable part of your essential oil lineup. It can be used in place of most every other oil in a pinch and has wonderful properties of its own. Lavender gets a lot of attention due to its fresh floral scent and is known for promoting peace, calm, and relaxation. Lavender is a popular choice in households with children, as it is considered to be a ‘safe’ oil. Lavender essential oil is a great oil to first invest in and one oil you should always have on hand. Strong and potent, when using peppermint oil keep in mind that less is more. Peppermint essential oil is a stimulant and is often said to increase energy, while fighting fatigue and exhaustion. Used as a flavoring agent, peppermint is packed with beneficial vitamins and nutrients to support wellness. Peppermint essential oil is also used for an aid in digestion. This should NOT be used around children under the age of 6, though, due to it’s high menthol content. Medicinal in scent, rosemary essential oil has benefits such as helping with upset stomachs, easing migraines, and boosting energy by reducing fatigue. It is also said that rosemary can help to relieve congestion and coughs. Rosemary is also an antibacterial oil, making it great in homemade soaps and deodorants. It’s obviously a great oil to have on hand! Remember that although essential oils have different properties, how we respond to them is unique. Our individual experiences with specific oils may differ from others. As you become more experienced with essential oils, you’ll come to know how each of the oils affects you and find some favorites of your own. What are your favorite essential oils to have on hand? Are these 5 on your list? Be sure to pin this for later!